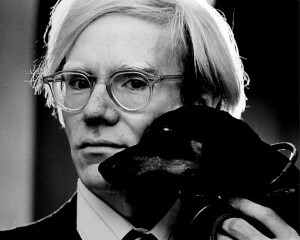 Warhol was born Andrew Warhola, probably in Pittsburgh. He became a commercial artist, an experience that inspired him to create works generally recognized as the first instances of the Pop Art movement. In 1962, he exhibited paintings of Campbell’s soup cans, Coca-Cola bottles, and wooden sculptures of Brillo soap pad boxes—all icons of everyday American life. The following year, he added the dimension of mass production to art through silkscreen printing. Warhol challenged the definition of art versus everyday banality by bringing the one to the other. He transformed himself into a Pop culture figure, as his New York studio became the gathering place for a variety of “underground” celebrities.